Then again, some days it can seem all too easy. Today Jeff Paisley, Chuck Garwood, and I took a trip to fish Helton Creek, a small stream in the mountains of North Carolina located near the town of Jefferson. The start of the day had all the makings of a tough one. When we got out of the car the temperature was 27 degrees with a stiff breeze and there was ice lining the creek bank. I made the remark to Paisley that this could easily be a fruitless trip. Paisley, ever the optimist when it comes to fly fishing, said that he thought this might be a day for big fish. Luckily for me he was correct. I tied on a small copper john beneath my strike indicator and picked a likely spot. My line began to freeze up and the strike indicator I was using started sinking due to ice build up. Despite all this the fish were plentiful and eager to bite. 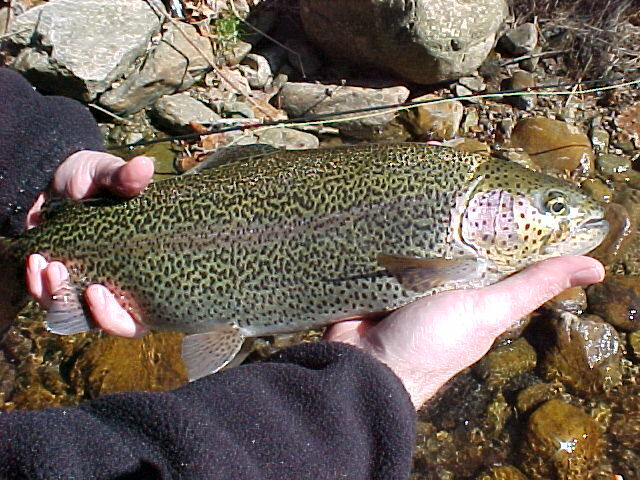 Almost every other cast would yield the ever so slight pause of the indicator that told you a trout was mouthing the nymph. Ten fish came to hand in quick fashion and I could tell by the bow in my fishing buddy's rod that he was having similar luck. This continued and after about a dozen decent fish each (12-16 inches) we decided to go back to the car and get the camera. I switched to a size 16 olive woolly bugger type fly (one of my ugly flies) . Paisley just happened to be manning the camera when my indicator went under. I raised my rod and felt something solid attached to my 7x tippet. Thanks to Paisley's skillful help with the net I was able to land what turned out to be my best fish of the day, a fat 19 inch rainbow trout. We snapped a couple of quick photos and then released the big fish back into the creek. The day continued and the fishing remained just as good the entire time we were on the water. We lost count, but I am sure that between the three of us we landed at least sixty or more trout in the four or so hours we fished. I have had some tough days on the water. I have had days when no matter what I tried the fish would not bite. I have had days that made me want to sell my rod and take up golf exclusively. Today was not one of those days. It was the kind of magical, in the zone, day that reminds me why I fly fish.